We have a problem. A people problem to be precise. As I have been discussing of late, it is clear the human locusts are overgrazing the planet. We need to slow our breeding. This is all very well and good, of course, but in order to do that we will shift the age distribution of the population. We live longer. Based on United Nations projections, global population growth isn’t slowing as fast as we need. 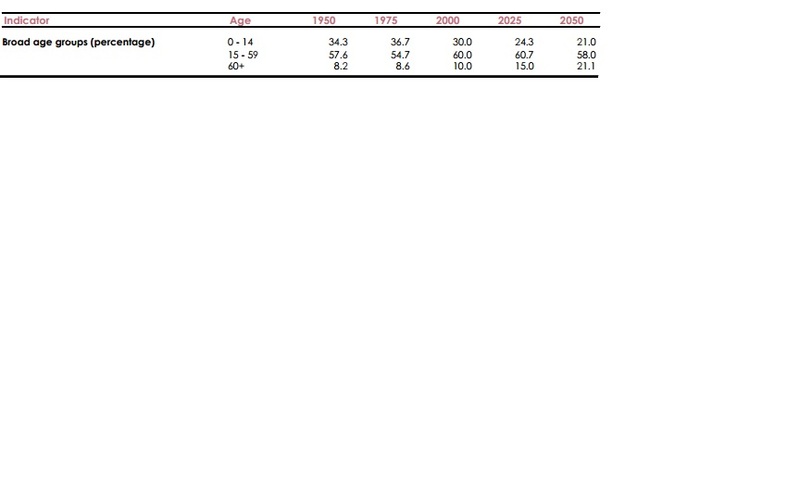 I have sourced these figures from a report prepared for the 2002 World Assembly on Ageing. There is considerable regional and age data available in that report – I have concentrated on a summary view. As considered recently, it is the developing countries where the population growth is most noticeable. We have SO many displaced people in the world. The number exceeds 51 million, according to the UN. There are 10 million stateless people in the world. If our population keeps growing, so will the number of people with no stable home. Children with no education. Minimal health care for millions living in refugee camps around the world. We see what we are doing to displaced people who arrive in Australia – the future may well be worse. 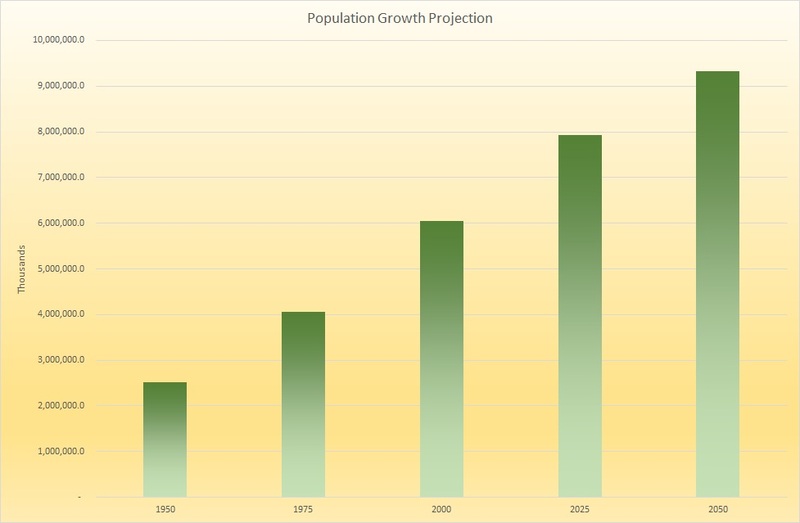 The source of the above chart does state “Population growth rates have been dropping in all regions of the world since the 1970’s, and this trend is predicted to continue. Current expectations are that the human population will level off at about 8.9 billion people by 2050, and stabilize or slowly decline thereafter.” However, it also states projections are “Notoriously inaccurate”. Are the rates dropping fast enough? I’m radically suggesting not just a decline in the growth rate, but an ultimate (i.e. sometime beyond 2050) decline in the total population. Many researchers report the rapid increase in population is placing an ever-increasing strain on the environment. The environmental challenges we face must be considered with the population explosion. These are not separate, discrete problems we can consider in isolation of each other. We must control our footprint on this planet, however to do so means we will go through quite a number of years with a greater proportion of the population aged seventy or over than we have ever experienced. This poses social problems. If we reduce the number of children born, there will be fewer to care for the aged, whether than be privately within families or via social welfare funded by taxes. The developing countries are the least equipped to provide a social welfare system. To see what we could achieve if we tried, I took the figures and played with them a little. If we reduced our global birth rate initially by a third, then by half, we could reduce the projected population. These are completely arbitrary reductions. I have no suggestions as to how we achieve this. The Pope has at least said humans don’t need to breed like rabbits, so that is a start. China has had policies in place for years to try to tackle their contribution to population growth. I split the population at seventy, simply because that is the age Australia’s current government is planning to set as the retirement age. The young also have to be cared for, however I have excluded the young from the above analysis as most of the dialogue focusses on the “ageing population”. 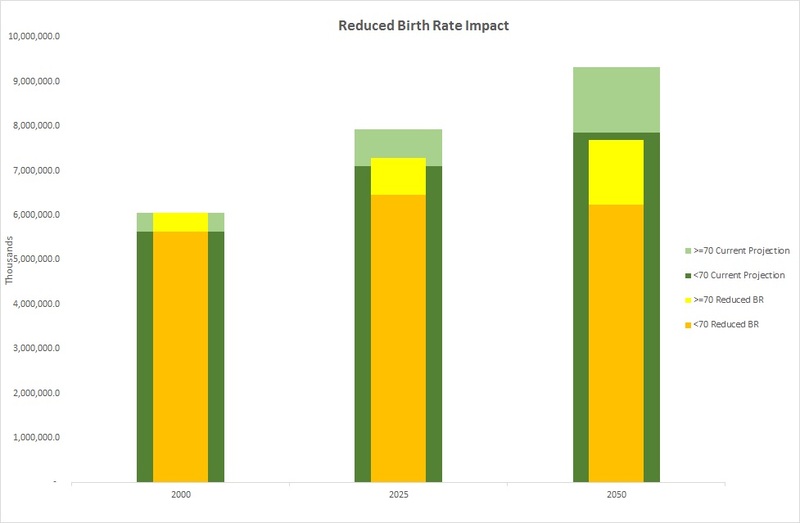 Such a reduction in the birth rate would assist the environmental impacts positively, but may have negative social welfare impacts unless we plan ahead and perhaps even make some major changes to how we distribute wealth. … this year that the comparison was now even more stark, with just 80 people owning the same amount of wealth as more than 3.5 billion people, down from 388 in 2010. In other words, eighty people hold as much wealth as half the world’s current population of seven billion. Visually, it is difficult to represent such an imbalance. It is difficult to comprehend such an imbalance logically or see enough compassion. This is not about catering to the lowest common denominator, as was suggested to me by a “I’m alright, Jack, the rest can starve” type the other day. This is about preserving the human species without annihilating millions in the process. The poorest are where the highest birth rates are, but also the shortest expected life spans. We can see quite clearly the shifting age distribution in the UN projections, from 1950 to 2050. Interestingly, the proportion of the population outside what could be considered the working age range remains at 42%. If we reduce the birth rate and life expectancy continues to increase, the above distributions would shift with a higher percentage in the 60+ age group and less in the the 0 – 14 age group, but the overall percentage may remain of the same or similar magnitude. We have to do something. Yes, that may mean adjusting beliefs and values that were formed over two thousand years ago when the population was considerably less than a billion and we hadn’t ravished our environment. How we solve these problems facing humanity, I don’t know. I do know we need to start putting pressure on our leaders to find solutions. Leaders that believe Noah is going to save us are not going to be much help. Edit: Improving educational opportunities, especially for women, would assist greatly. The latest 100 People project statistics shows only seven percent of the seven billion people have a college education. Debate about population growth among rich westerners always seems to focus on birthrates and puts the blame on Developing World women. In reality there are two drivers of populations: fertility AND people living longer lives. So do those who advocate enforced contraception also advocate euthanasia for the over-fifties? Of course not. The core problem is less in the developing world than in the developed, as a child born in the developed world uses 6-10 times the amount of resources (water, energy, soil, food, metals etc) and it is resource misuse (including climate change) that is degrading the planet. But do those who advocate enforced contraception ever try to reduce their global footprint or even recycle what they waste? Very seldom. That said there is a solution to the population crisis – and the women of the world have already found it, regardless of men: in ALL societies they are reducing their fertility. This seems to be a decision taken at the species level, as well as the individual. However the paradox is that ZPG is achieved only after attaining a certain living standard, which involves using a lot of resources. Prosperity is still by far the best condom. This being the case, ending poverty will drive the decline in fertility a lot faster and is the best strategy. Women then make the decision to have fewer children for themselves as they acquire higher living standards, education, good health care, careers etc. The problem is that the global economy hates the idea of a shrinking market and is dead against it, while most governments, including ours, obediently offer their citizens bribes to have more babies. So, women have the answer to the population issue – but that is by no means the only existential crisis we face. There are 8 others, all interlinked, which imperil the future of civilisation and maybe our species. Julian, thank you for a wonderful contribution. I hope I didn’t imply the problem was in the developing world – I see this as a global issue to be solved in a united fashion and education certainly plays a significant role, yet we don’t improve educational outcomes without achieving, as you rightly point out, a certain standard of living. I do like “prosperity is still by far the best condom”. Ah, yes, the “baby bonus” – one of the stupidest ideas ever implemented. Women have the answers? Julian, you realise you are risking the combined wrath of a considerable number of the global male population descending upon you? 🙂 It is interesting you say that, because I once looked at the question of women and religion https://teamoyeniyi.com/2012/11/09/what-is-it-with-religion-and-women/ (some crazy attitudes expressed during an election in the USA got me started) and I notice biologist E. O. Wilson talking about religion (tribalism really) and the impact on out future http://www.alternet.org/belief/eminent-biologist-religion-should-be-eliminated-sake-human-progress. Women may well hold the answers, but to put those answers into practice, we have to shake off patriarchy. Not shake off patriarchy. Overthrow it. Subvert it. Crush it. I have to say that human survival is a much more serious issue, for me at least, than the equality of the sexes argument. If male thinking is allowed to predominate in a world of massive numbers, dwindling resources, climate change, environmental collapse, weapons of mass destruction and macho leadership, we’re f*cked, to borrow a phrase. If women rule, and are not dominated by males into male behaviour but follow their natural instincts, I think we have just a window of hope. Regarding religion, there are two main types – male dominated monotheism, and female dominated fertility beliefs. I don’t hold much brief for either, but in terms of human survival we need the latter more than the former at this juncture in history. So if we are going to have beliefs, then we don’t need people who believe ‘god will save us whatever we do’, but rather ‘the deity will smile if we save ourselves’. So I’m going with the Earth Mother. But ancestor worship has a grain of commonsense too: those old coves knew as thing or two, or we think they did…. Leadership is a major issue. The west has grown up with this absolute myth about the brilliant leader, from Achilles to Alexander, to Julius Caesar, Jesus Christ, Napoleon, Hitler, Stalin…. Kevin Rudd, Julia Gillard, Tony Abbott… God help us. We keep hoping some miracle worker will take away all our problems – and they always disappoint. I have a feeling a more Confucian approach would work better, in which people teach, learn, share, trust, collaborate, perfect themselves and lead in community, solving their problems that way, rather than adoring some telegenic airhead. I hope the Chinese diaspora brings that to Australia, but I have a horrid feeling they have drunk at the well of US free market capitalism instead! Your point on leadership is certainly true. Not a lot of collaboration when we depend on a single “brilliant leader” – also it could be said to be an abdication of responsibility, which is a little how I view belief in a deity. Leader or deity, there is a dependency on someone or something else to “save us”, as you say. The rest of the animal kingdom has various social models, from lone males/female herds to individuals joining only for breeding through to collegiate groups. I’d like to be a fly on the wall in another 1,000 years (providing, as you said earlier, we manage not to blow ourselves up) to see exactly how society is reshaped to become more equal, or will we end up in some Elysium-style horror film? Imagine: 80 people hold as much wealth as half the world’s population. Staggering. Reblogged this on A Whole Lot Older, A Little Bit Wiser …. In the UK the retirement age has gone up in stages, I won’t be able to retire and claim a state pension until I’m 66 and a half. However employers are ageist and the inevitable sickness and or general slowing down is frowned upon. I’m really not sure what the government expects people to do! I don’t know either. Here there is no state pension after a certain date of birth. I still qualify, but my older children definitely don’t. We had many years transition, but we are only 20-odd million of the 7 billion!